This year we have been focusing on Book Studies. We have read several great works of literature including Love That Dog and Bridge to Terabithia. Recently, we picked up another Newberry Award winner. After 16 pages most of us were having trouble ‘getting into’ the book. We weren’t even through the first chapter yet – it was 24 pages – when I stopped and asked the students what they thought. At first, they were reluctant to be completely honest. They said things like, ‘it’s okay’ and ‘eh’. So yeah, when I gave them my honest opinion, they opened up a bit more. I have difficulties with reading comprehension, which they all know about, and I simply told them that I was having trouble ‘getting into’ the book. Collectively, they all breathed a sigh of relief and opened up. In the end, we decided to put the book down – at least for now – and move on to something different. This is where Plastic Times comes in. Last year my class wrote, directed, produced, and acted in their own movie. It was an empowering experience. Within the last year, A Tale Unfolds has expanded their resources and restructured their payment system. Essentially, they have a ‘suggested’ price but will accept what you are willing to pay. Yep, even if you want to pay nothing! Which is brilliant, since their generosity makes me want to pay the suggested price and not try to get a cheaper price. 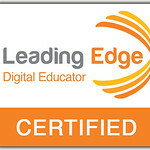 A Tale Unfolds has partnered with several quality organizations, including CNN, to create top quality lessons. Teachers, everything is included! Anyway, after the book fail, I wanted my students to participate in something meaningful, fun, and most importantly, rigorous. So, I went onto A Tale Unfolds and was immediately drawn to Plastic Times. This lesson incorporates research, forming opinions on facts, (high quality) writing, and PBL. Friday we started our new path. The first lesson has students reviewing five different pieces of ‘Evidence’ (all factual) and taking notes. They are investigative reporters learning about the impact of plastic on our environment, animals, and us. Then, they are to form an action plan. When each group received their ‘Evidence’ I don’t think they thought I would stick to the 4-minute timer. I printed one copy of each piece of evidence and so they had a certain amount of time to review and take notes before passing it along. After the first round, they got the message. They then watched a 14-minute video produced by CNN to further their knowledge on the subject. Honestly, I have never seen the students so engaged. They really wanted to get all the information provided and answer all the questions on the guiding worksheet. And that was only day 1! I can’t imagine what the rest of the three weeks will bring, but I’m excited to see where this takes us! Last week I had a great discussion with my class about the use of hashtags (#). What is appropriate, how many to put in a post, what they really mean. Talking about hashtags in the classroom always reminds me of Diane Main. When I attended the Google Teacher Academy in 2012, she was the one that had the revelation on their meaning and how to use them in the classroom. Diane’s ‘ah-ha’ moment included the idea that hashtags were much like the main idea. So keeping this in the back of my head, I brought it up to my class last week. We were doing a lesson on dialog. I asked them how they would hashtag the lesson (after explaining that it was the main idea). At this point, I realize that they had missed the point of the entire lesson. Yup, a fail. So after going back and re-explaining the lesson, they came up with #quotations and #dialog. This has lead me to the conclusion, that I need to ask students, “How would you hashtag this lesson?” Using Diane’s idea – Main Idea – I can quickly get a pulse on the class if they ‘got the point’ of the lesson. My point? Hashtag your lessons! It’s relevant. It’s fun. It’s informative. And Diane is/was brilliant! Recently I began a unit on the Reasons for the Revolutionary War. It’s all gamified and I am usually 1 step ahead of the kids. Last week, I was about an hour ahead of the students. I had a group getting ready to start creating their Boston Tea Party movie that afternoon. At lunch I had the thought, “Hm, I should probably have them create a storyboard”. I then began looking up storyboards, and stumbled upon Storyboard That. 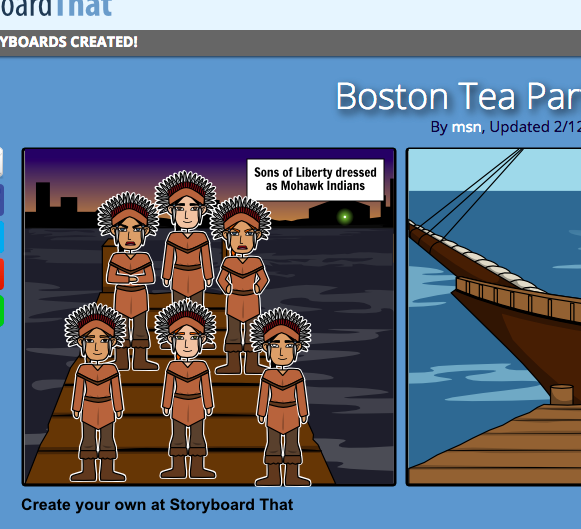 It had several great examples of simple storyboards on the Boston Tea Party. I only meant to give my students some example so they could either draw theirs on paper or on Google Draw. My lack of direction and the group’s internal fearlessness, lead to better than expected results. Instead of my students taking the easy way out, they dove right into the new tool. 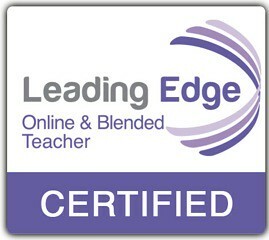 The students came came to me after 15 minutes and asked for my login. I told them that I didn’t have one for the site, and asked why they needed it. They then showed me their work. Yeah, they started creating their own story board, and the site prompted them to save it. So I did what anyone else would do. I created an account on the spot! Glad I did, too. The students are being creative and showing me what they learned.